Lighting can be one of the most transformational things you pick for your home AND also the most frustrating. Scale, size, finish, hang height, light....all of these things matter. And when you live in an open floor plan, as many people do now...the challenge to find lighting that works well together is even greater. Add to it the style home you have (architectural detail and ceiling height)...and you're sure to drive yourself crazy trying to figure it out. Recently, we've had a few clients who needed a bit of help with some home updates...and lighting was number 1 on their list. We needed to come up with a range of lighting options that felt like they coordinated without being exact matches of each other and were reasonably priced. 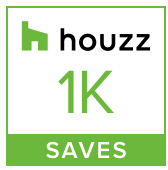 Additionally, these are for EXISTING HOMES...not new builds. Which means, we had to take many other factors into account, such as cabinet style, flooring, furniture, structural details other home accessories...and of course, the client's style. We don't need to break the bank on lighting, but I would recommend putting some thought into it, as nice lighting can truly enhance a space. Here are a few recommendations that we came up with for our clients. You heard it...fairly new home...builder grade lighting. She was ready to give it a little upgrade with some new pendants and chandelier. Here are a few combinations we recommended. . . simple and stylish, but still cohesive with what was already happening in the home. from left to right: Katie Globe Pendant, Morris Lantern, Robinson Medium Pendant, Capiz Tiered Chandelier, Montgomery Pendant, 2-Tier Round Linen Shade. Ok, this one is kind of crazy...and I kind of love it. The home was built in the 1980s as an 18th century reproduction. Yes, that's right...wrap your head around that for a minute. It's got a whole lot of wood detail and a whole lot of "it was the 80s and we're not sure why they did that." The spaces all run into each other and some of the details carry thru and some do not. The new owners are immediately making a few updates and top on the list next to paint is lighting. Unifying these spaces will be key in creating a better flow, more visually appealing space. 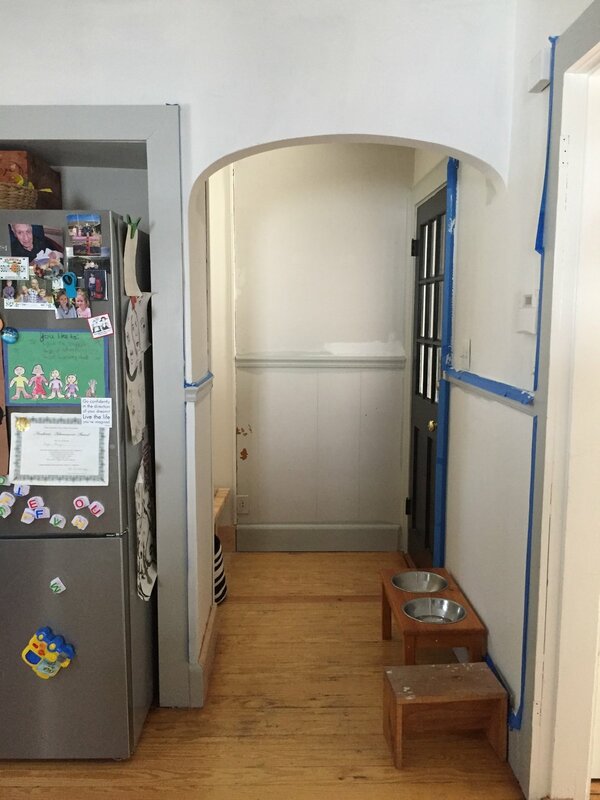 Painting the woodwork and cabinets will certainly help pull the space together. And we want the lighting to add those nice, interesting accents that allow our eye to continue thru the space and not feel overwhelmed. Take a look at the existing space...woah lights. woah wood. left to right clockwise: Darlana Medium Lantern, French Cuff Double Pendant, Katie Small Globe Sconce, Bistro Small Round Chandelier, Vendome Single Sconce (polished nickel), Vendome Double Sconce (antique silver), Vendome Single Sconce (antique silver), French Cuff Sconce. left to right clockwise: Morris Lantern, Katie Globe Pendant, Katie Small Globe Sconce, Reed Small Chandelier, Katie Small Globe Sconce, Elkins Sconce, Elkins Double Sconce, Reed Single Sconce. left to right clockwise: Darlana Medium Lantern, Precision Small Pendant, Bistro Single Light Curved Sconce, Berkshire Drum Chandelier, Bistro Single Light Curved Sconce, Bistro Double Light Curved Sconce, Bistro Single Light Curved Sconce, Hackney Single Sconce. Just about EVERYONE wants to update their kitchen, right?? Especially if you're like us and you live in an old house and only made it slightly more livable when you moved in. AND even more so if you are in the design and food industry. 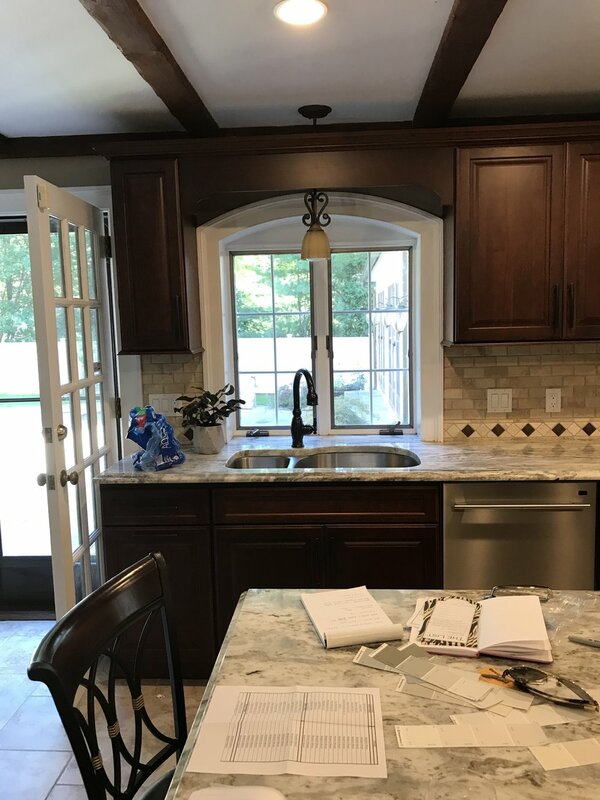 Obviously our dream kitchen is still many many years and larger budgets away...but for now we decided to take on the task of updating our kitchen to make it cleaner, cooler and more functional. We live in a 1930ish Colonial in New England. Pretty straight forward and standard with some old charming details that make these homes beautifully challenging. Some of the things I love about this old house are the grainy wood floors in our kitchen, the rounded arches and detailed moldings. 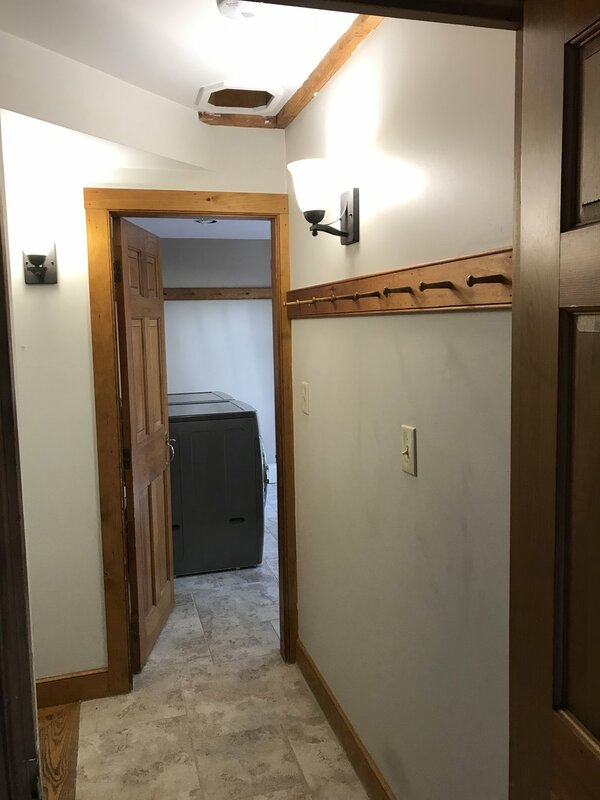 That said...a home like this has a lot of challenges...like small spaces and oddly placed extras...ahem...our bathroom that is directly next to the stove AND a tiny side entry that walked you directly into a pantry. To be honest I really love these old homes, challenges and all. Because it forces you to think creatively, but also be mindful of the overall aesthetic of the home and design within that. So when we moved in 4 or 5 years ago, we quickly knocked down the wall between the kitchen / dining room to open that space up. We painted and ripped up carpet. Widened a door way a bit to the backroom and moved right in. After living with a laminate counter top and old sink for these few years...we were totally ready for an upgrade. And seeing how much we USE our kitchen, it made sense to do this. My husband, who loves to cook, was totally down with the upgrade idea when he realized we would have a bigger sink and no more gap between the stove and counter top where there was a collection of just about every meal we've ever cooked. 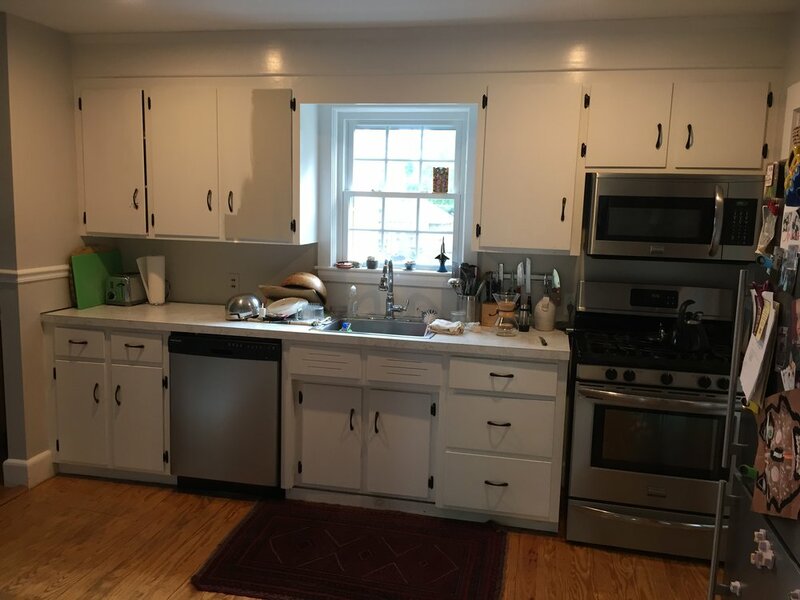 We knew off the bat that replacing the cabinets was NOT in the budget. This was going to be a small upgrade to our current space to make it feel more functional, livable and stylish. I started by pulling some photos of areas that inspired me and also had a similar aesthetic and vibe to my home. I have been inspired by and drawn to white walls and painted trim lately, green to be specific. I was determined to use it, but I had to be mindful of the way it would translate on our old cabinets and in an area that doesn't get a lot of direct light. That means...just because you like something, it doesn't mean it is the best option for a space. FIRST...I pulled some images that inspired me and felt like they had a relatable vibe aesthetically speaking. . . classic with some modern, clean elements was what I was going for. 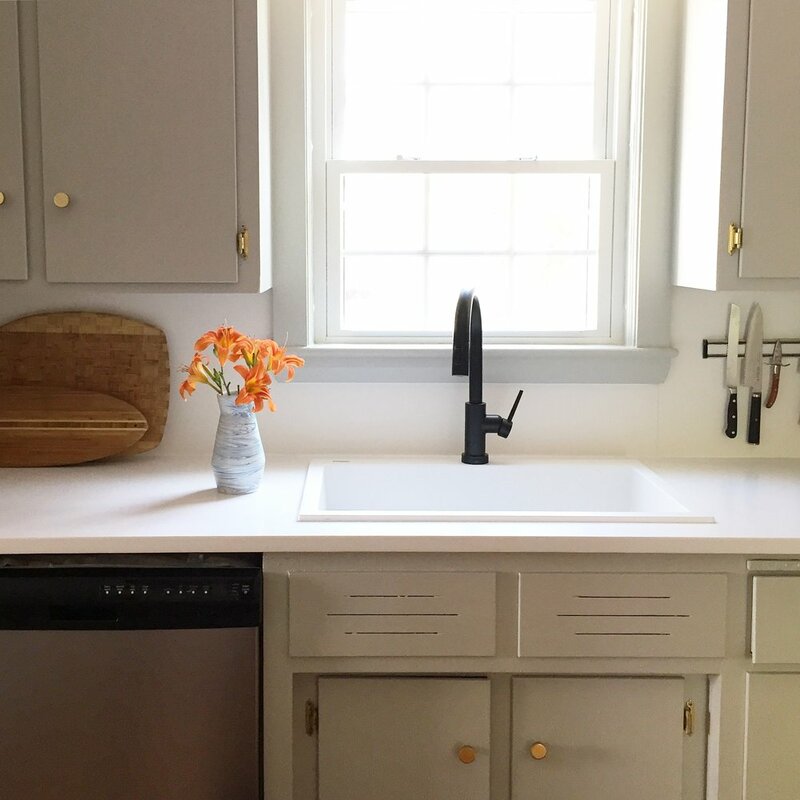 The renovated kitchen of designer, Sarah Sherman Samuel. Love the color palette here with that fresh, clean look and pops of modern accents. create entry nook - create feeling of more space at door and cleaner look for storage of coats, shoes, etc. Then I created a style board that includes most of the items. Doing as style board can be HUGELY helpful when making sure each selection feels like it works together. I find my clients really appreciate this piece because having a visual is always so helpful. Of course seeing items in person is always the best...but this is a great step regardless. I was sure to sample as many of the fabrics and finishes prior to purchasing to be sure I was happy with the color and quality. Additionally, this is where I prefer to splurge a bit. Finding materials that are artfully and thoughtfully created is something very important to me in design. I encourage you to click on the links below to learn more about some of these designers and their studios. They're pretty badass. 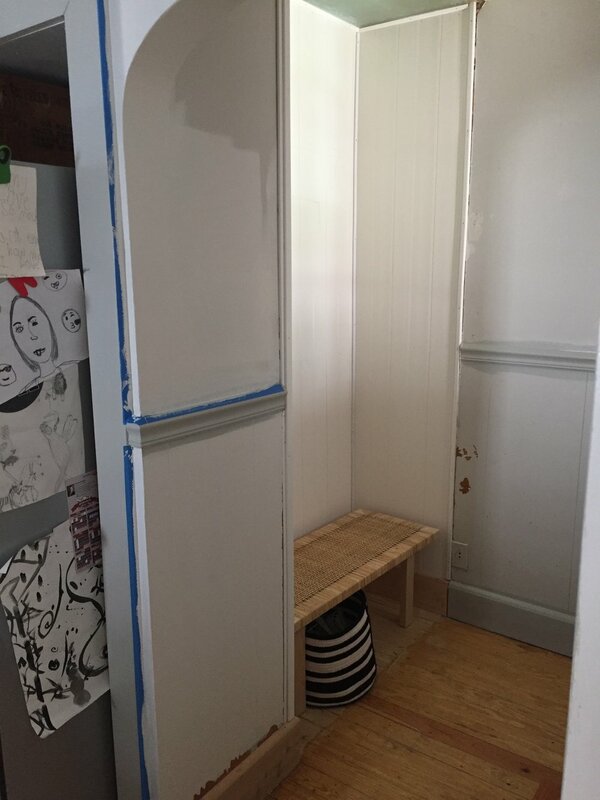 We've made some progress...cabinets are painted, sink and counter tops are in, entry nook is almost complete...but I am STILL painting in some places. Next up will be our ceiling repair and light fixtures (CAN NOT WAIT! ), backsplash and new stools (finish still being decided). Here are a few pics of the BEFORE and IN PROCESS...stay tuned for some real deal pics this fall when it's complete! The hardware change was a big upgrade and allowed the flat front cabinets to get a little pop. Aged brass with textural detail added interest and worked well with the color palette. AND I can't say enough about the black faucet. This was something I knew I wanted to add a modern, clean touch. It was definitely a *splurge item and totally worth it from a design and functionality stand point, since these are important factors for both Matt and me. Mixed with the white quartz top, I'm loving how clean and bright the space is starting to look. It seems like we've been living in March for 3 months, here in New England. End of May and it's still cold and rainy. But it is Friday! And a long weekend is ahead. We'll be doing lots of grilling and drinking of delicious things, which I'll be sure to post about later. Today I'm starting a post called "inspired by," where I'll post about things I'm currently feeling inspired by, such as interiors, art, food, pretty much anything. So to get started, I decided to post some of the interiors that I am always inspired by. These images have lived on my Pinterest boards, or have been saved somewhere in my phone. I revert back to these images often for inspiration for various projects, or my own style goals, or because I just enjoy looking at them. The designers of these spaces are ones I admire and regularly turn to for inspiration. I have been obsessed with this space since I saw it in last years Architectural Digest. 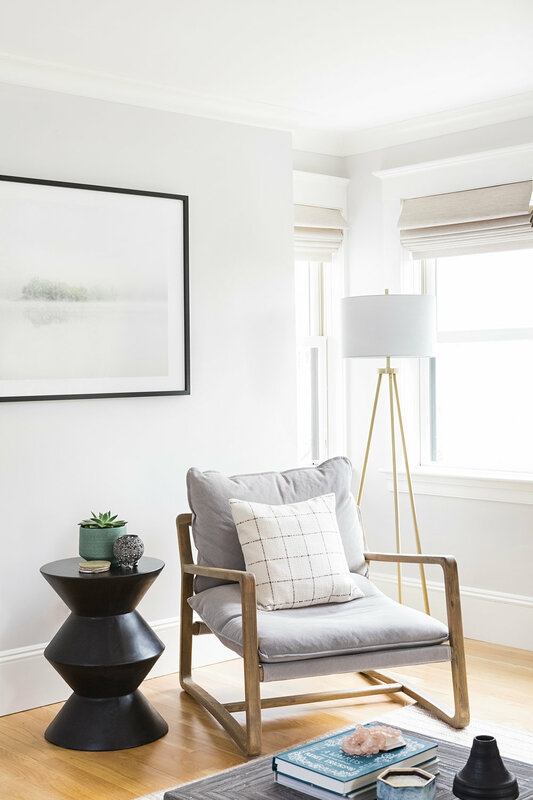 The design of this home was so thoughtfully executed in the most subtle way that is not just calming, but so inspiring. I mean...just look at it! The natural palette is infused with elements of nature, from the plants, the artwork, and the textures and forms of the furniture, rug and accent pieces in a way that creates such visual interest and harmony. The wall detail as it relates to the stripes of the rug is also beautifully articulated. Interior Design by M. Elle Design and Architecture by Ken Lindsteadt, as featured in Architectural Digest. One of my favorite designers right now is Brian Paquette. Brian creates livable interiors that blend color, pattern and texture in a way that feels daring, yet refined. And his styling is so on-point...I can't get enough. Follow him on Instagram too for some seriously amazing vignettes or style inspiration. I feel like there's a bit of a theme here. Soft whites, dreamy/mysterious art, plants, furniture with character...and a whole lot of texture. Maybe we'll move to Cali? Here it is...as promised...my first blog post. If you follow me on IG you know I said I was going to do it this week. And yes, that was said with a cringe face emoji, because I was feeling partially terrified about jumping on the blog train. BUT...I actually don't feel like cringing because I get to use this recent project reveal as my first post...and it's one of my favorite projects to date. 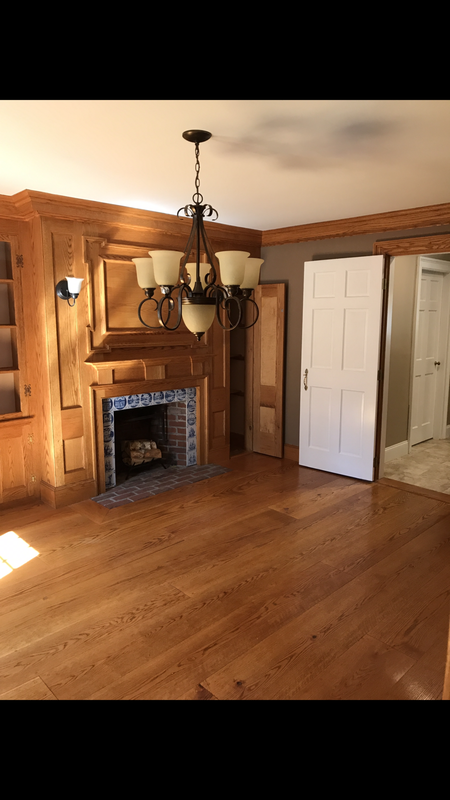 This family had recently finished a year long renovation of a colonial New England Home. They had spent 12 years in this small, old home raising 4 boys and were definitely ready (and deserving!) for some more space. 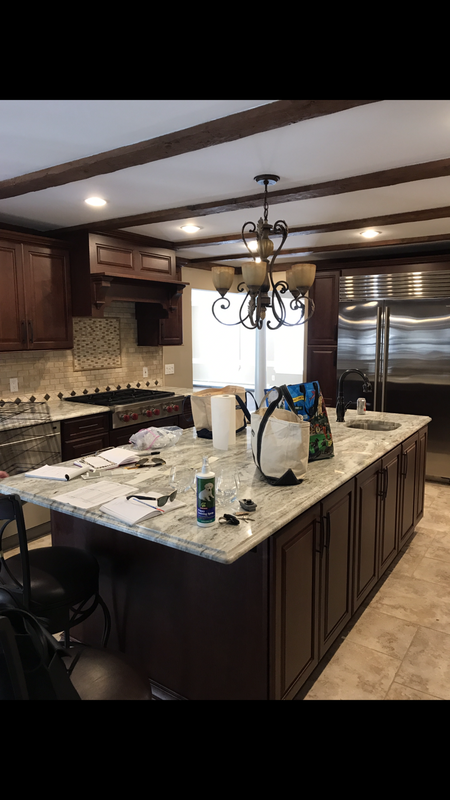 I came in a few months after they had moved back into the home to help them with some final selections for the fireplace and kitchen tile, windows and furniture for the Family Room and Kitchen-Living area. Easily a favorite project for me because I not only had sweet, trusting and fun clients, but they also had great style. It was important that this space not only looked cool, but also functioned for their active family. The style was a west coast meets east coast kind of vibe that was casual and comfortable. Hope you love it as much as I do!